Today, I’ve decided to develop a self-love mantra as the beginning of a love affair I intend to have with myself. While I certainly love myself, I must admit that I have not demonstrated the deeply intimate unconditional love that I give so easily to others. I have a sneaky suspicion that I am not alone. Self love and acceptance is something that I’ve struggled with from time to time. Although I treat myself well, its much easier for me to adopt someone else as my object of affection. Call me a “mother hen”! If there is someone in need within 50 feet of me, I am on it. I completely enjoy taking care of others but I tend to use that as my excuse to neglect my personal needs. This is especially true in intimate relationships, I give sometimes to the point of sacrifice. Noble on the surface, but unreciprocated, loving in this way is not exactly the best approach. Takers are definitely attracted to givers but that’s a subject for another time and post! If you are like me, it can feel a bit unnatural to say, “I love myself”. I intend to explore and address these feelings starting today! It is important for me to shine light into the shadows and fall in love with every thing that is uniquely me. Saying, “I love myself” should feel empowering. It is the most important gift that you can offer yourself. I understand that what I project into the Universe about myself is graciously given back to me multiplied. Only, it can not be manipulated. I intend to uncover the root of any unflattering views of myself and magnify the reality of the beautiful expressions of life that are uniquely me. If ever you’ve felt desperate to feel unconditional uncompromising love, now is a great time to create your personal “self love”mantra as well. As acceptance of who you are deepens, It’s okay that the mantra changes or grows. In fact, I think it should. Ultimately you have within yourself everything that you need to live a physically and emotionally loving and expansive life. 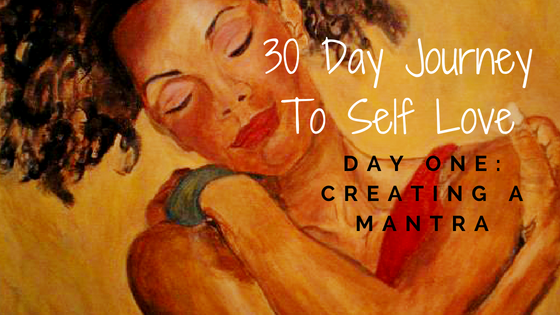 For the next 30 days, join me as I focus on loving and accepting myself more each day. My goal is to become unapologetically me! I want to show up for myself. Love myself unconditionally without regard to anyone else’s approval or validation. Here is my “Self Love” mantra. Prayerfully, it will inspire others to create their own and begin the most important journey of their lives. I love myself. I offer myself the gift of unconditional love and acceptance. I receive it freely. I give my self permission to explore life in a way that is exciting and feeds my needs. I believe that every thing that I need to live happily is effortless given to me by the loving Universe. I am free to choose and create loving experiences for myself. I am a delightful person and those who recognize my awesomeness are drawn to me. The Universe supports my decision to deepen my love for myself.